Updated: Latest update on where we donated is at the bottom. For years my wife and I have kept a glass jug that's acted as a destination for any loose change. When we were younger it was an easy way to save. The unwritten rule was that whenever you came home and there was loose change in your pocket, you'd dump it in the jar. About every year or so when the jar became significantly full we'd dump it out, put all the coins into paper sleeves and take it to the bank. It would usually end up being spent on something fun, frequently as "spending money" while on vacation. A little something to splurge with. As our kids got older we included them when it was time to count the jar, but never allowed them to put their own money into the jar. They have their own piggy-banks and we've encouraged them to save up their money. Teaching two little boys to save is a tough chore though. They always want to spend money and buy stuff, whether it be toys, food, books, video games, music, you name it...the money doesn't last long with them. However, when it came to counting Mom and Dad's money jar it was still a fun job because they got to get their hands on so many coins at once (which they think is a lot of money). I mean, if I could run my hands through a million dollars, I'd be interested even if I couldn't keep any of it and I think they felt the same way. Over the years the jar has provided a decent bounty, usually around $200 each time we count it. Not bad for dropping loose change whenever you can. Well, the jar has been getting closer to full the last couple months and the kids showed a renewed interest in how how much was in it. About a week ago our youngest son decided he wanted to convert a lot of loose coins that he'd saved into paper dollars. My wife told him that if he wanted to count his change and drop it into our jar, she'd give him the equivalent amount in paper money. It was a deal. I felt happy he was learning a good lesson, the value of saving coins and the reward of turning it into "real" money as he calls it. However, that wasn't the lesson to be learned from this experience at all. About a day later our youngest approached me. Out of the blue he asked me what I was planning to do with all the money in that jar. My immediate thought was "here we go". He must have something in mind he wants, maybe the new Nintendo DS, maybe a new video game or toy, and he wants to use the jar money. I mean he's an eight year old boy who loves playing on his iPod touch and doesn't think twice about asking if we can buy a new "app". He must want something. As I prepared to answer him I was already putting up the defenses in my head...the explanations I'd use to teach him why he can't have any of the jar money for his own spending. My answer? "I hadn't really decided what we'd use the money for. Why do you ask?" His response? "Well I was thinking maybe we could give it to someone who needs it, like a hospital or kids that have cancer or something." Any remotely prepared response I had in my brain just fizzled away. It took me an extra beat to realize what he said and then a wash of emotion swept across. The reflection in my mental mirror was looking back at me saying "Wow, why didn't you think of that...you're supposed to be the one teaching the lessons." I told him what an excellent and caring thought he had and assured him I'd take him up on his idea. We'd definitely count up the jar and donate the money to a good cause. This past weekend we counted it all up. 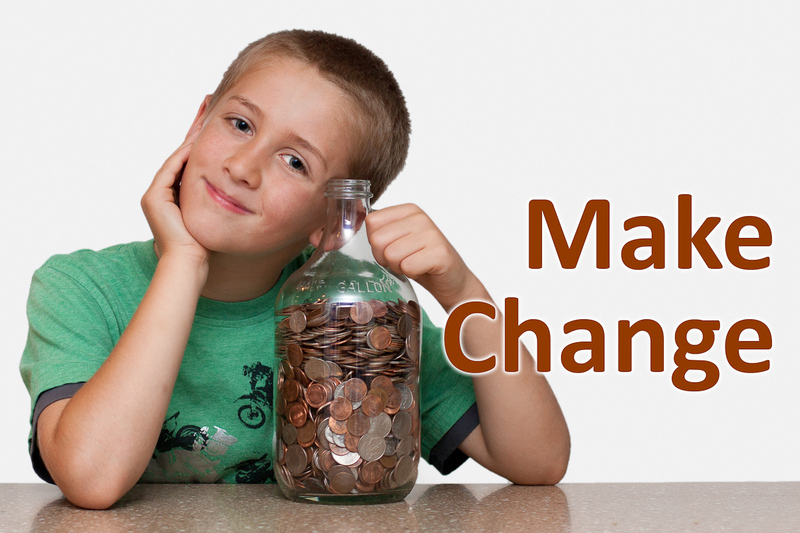 When a couple of our change sleeves came up short of being full, both kids gladly donated a few extra coins from their own piggy-banks to fill them up. Grand Total: $157. Not an Earth shattering amount, but a ton of money to an 8-year old and I can't wait to see the look in his eyes when he hands it over. I've decided from this day forward that every coin we drop in that jar is destined to make a difference. You may know the saying, "Either lead, follow, or get out of the way". In this case I believe he took the lead, and I'm more than happy to follow his generosity, wherever it may go.